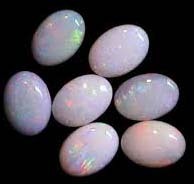 Opal Gemstones is shining gem and comes in different hues and colours like black, red yellow and white combined together. A white snowy landscape, dotted with fireflies fo red, gold blue purple and green is a valuable possession for many gem lovers. The finest and most valuable comes from Australia. It is a hydrated silica (Si02.nH20) with a water content within the mineral structure. They contains 6% - 10% water and consists of small silica spheres arranged in an orderly three dimensional structure. 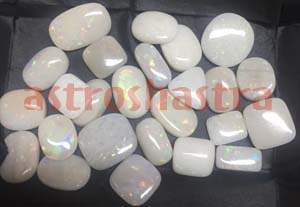 It is created by percolating water in or near sedimentary volcanic ash that dissolves silica of shells, bones and woods, "fossilizing" them into birthdstones. It is not a particularly hard stone so care must be taken to preserve the natural beauty of this gem. It is truly the "Queen of Gems" and the Eve of the Gods. A stone of hopes, positive actions and achievements. It has always been one of the most popular and esteemed gems, known to absorb, carry and pass enormous amounts of energy. A mysterious gem, as each one appears different in its delicate beauty. 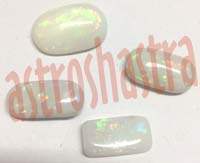 Promotes psychic stability and the capacity to share. A stone of love and romance and a stone to grant wishes and personal happiness. It is good for bestowing beauty, power and for financial prosperity and for those in business , particulary connected with travel and tourism and imports and exports. It is also worn for personal charm of the wearer and for those wishing to have extra sexual powers. If it grows dull after use, it should be discarded and replaced by a new. It is called the queen of gemstones and has neen treasured since times immemorial for its extra ordinary beauty. It can also help you release anger and claim your self-worth. It also aids in locating and dissolving past-life memories. It, with its expanding intensity, encourages both freedom and in-dependence. It is must for those born in the month of October. It will make them loving and affectionate in personal and family life and will ensure them good opportunities and they will be able to magnetise others for good causes. It enhances the capacity to foretell and has been used by the most successful astrologers and occultists. It also helps the wearers to win litigation cases and to have greater stability in life. Legend: The Romans first popularised it about 100 BC and gave it the name opalus (to see a change of colour). They prized it above all other precious stones and believed the holder to be charmed with good fortune. The only European source of this rare and prized gemstone prior to the sixteenth century was the volcanic deposits of Czechoslovakia. Later the Spaniards brought back fine examples of Aztec from the New World. Beautiful stones have featured in many of the Crown Jewels of Europe and they remain popular with heads of state and the rich and famous. Where is it Found : Notable Occurrences include Western USA, Mexico, Australia and many other localities around the world. Australia produces approximately 95% of the world's precious available. Other deposits occur in North, Central and South America, and Indonesia.